Mountain Paradise by Thomas Kinkade is available for sale on paper or canvas, framed or unframed at special discount prices. Select from the following authentic Thomas Kinkade editions: standard numbered, artist proof, gallery proof, examination proof, international proof, publisher proof, renaissance edition, studio proof, Atelier National edition, and masters edition. "It is possible to embrace the world of our deepest dreams. I do that as an artist, and it is my fervent hope that canvases like my new Mountain Paradise enable you to do that as well." Gallery Proofs are restricted for exclusive distribution through Thomas Kinkade Galleries and Signature Dealers. Gallery Proofs are designated with the letters G/P during the numbering process and include a unique gold foil remarque stamped onto the image. Each canvas is individually hand-numbered and hand-highlighted and includes a Certificate of Authenticity. International Proofs are reserved for distribution outside of the United States. International Proofs are designated with the letters I/P during the numbering process and include a gold foil stamp on the front of the canvas and a watermark sketch on the back side of the canvas. Each canvas is individually hand-numbered and hand-highlighted and includes a Certificate of Authenticity. Master Editions are the ultimate expression of detail, artist involvement, and collectibility of any edition issued by the Publisher. Master Edition textured canvas lithographs are extensively hand-highlighted by the artist himself over the foundation of apprentice highlighting. Enhancing the exclusivity of the Master Edition is the personal touch of the artist's unique thumbprint and Master Edition Seal located on the back of the canvas. To signify authenticity, the artist's authorized security signature is hand signed in metallic ink, by Thomas Kinkade. The letters M/E follow the print number. 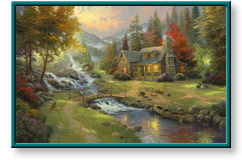 Mountain Paradise painting by artist Thomas Kinkade (also spelled Thomas Kincade, Thomas Kincaid, or Thomas Kinkaid) can be purchased in art print or canvas form at special sale prices at Christ-Centered Art.